Readers write: We’re a “one-trick pony” and we draw wrong lessons from history! As a new week begins, the S&P 500 is just over 1% away from reclaiming its record close on Jan. 26. What could possibly go wrong? Plenty, says Agora Financial contributor Mike Burnick. “The stock market has rallied nicely off the April lows, with the S&P 500 now within striking distance of new all-time highs,” he acknowledges. “Plus, the Nasdaq-100 Index notched a new high the week before last. “However, I’m not so sure that stocks are out of the woods just yet, for two reasons,” he tells us. The bars show the average performance for each calendar month during years like this one when there’s a midterm election. The line, meanwhile, shows the percentage of stocks that registered gains for each month. August and September are often dicey months for the stock market, and that’s especially true in years like this one. 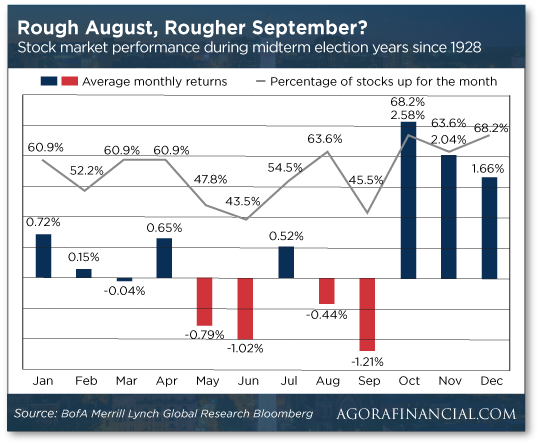 “Scouring the data all the way back to 1928,” says Mike, “stocks have declined an average of nearly 2% during August and September combined during midterm years. September is by far the worst, with stocks up just 45% of the time (or down 55% of the time). Then there’s the recent shakeout in the most popular tech stocks. Yes, Apple turned in terrific numbers and Tesla is rebounding (because its cash burn isn’t as awful as feared). But Mike is still a bit unsettled. Still… the news isn’t all glum right now. Tech might be hurting, but despite what the establishment financial media would have you believe, tech isn’t the whole stock market. “There has been a bullish rotation into other sectors beyond technology in recent days,” says Mike, “including health care, industrials, consumer discretionary and even financial stocks. That sounds like a situation that should keep you up at night… but Mike’s premium subscribers are resting easy because they followed a basic three-step retirement plan that’s setting them up for life. All you need to get started is a $500 grubstake (even $100 could work in a pinch)… a phone with which to make a three-minute call… and an internet connection with which to place trades. For best results, Mike says you’ll want to act before Wednesday — for reasons he explains when you click here. As the morning wears on, all the major U.S. stock indexes have tiptoed into the green. Even the Dow is up a bit and within range of the 25,500 mark. That’s despite another setback for the aforementioned Dow component Intel. It’s down another 2% today, and this time there’s no obvious catalyst for the selling. “I’m glad we sold our INTC position back on June 15,” Ray Blanco wrote his Technology Profits Confidential readers on Friday. That price was very near the company’s peak price in 2018 — indeed, this year’s peak is the highest price INTC shares have fetched since the tech bubble burst in 2000. Gold can’t catch a break — it fell on Friday and can’t get up today. At last check the bid was down to $1,210. But crude is up more than a buck and back within striking distance of $70 a barrel. The former Soviet republic of Georgia has become the first nation anywhere in the old “Eastern bloc” to eliminate prohibitions on pot. Growing and selling it is still illegal, but possessing it and using it will not subject you to fines or jail time. The news comes on the heels that Lebanon might become the first Middle Eastern nation to pursue legalization. “All around the world,” says Ray, “we’re seeing a push toward legalization that could bode very well for the international stocks in our portfolio that have lots of exposure to emerging pot markets. “It also bodes well for U.S. legalization in places… like the other Georgia.” Ray tells us in May, an Atlanta TV station commissioned a poll finding a majority of Georgians now support legalizing recreational cannabis. From the East Coast of the U.S. to the Middle East to the Black Sea, officials are moving to legalize cannabis. And they’re creating immense profit opportunities for investors paying attention. For the record: MoviePass will soon limit subscribers to only three movies a month. So much for the model of “all you can eat for $9.95 a month” that got MoviePass so much attention to begin with. The company says 85% of its customers see three or fewer movies a month anyway. “They will not be affected at all by this program, and even better, they’ll stop hearing MoviePass is going out of business,” MoviePass CEO Mitch Lowe tells The Wall Street Journal. Because you can’t be a real Tesla car owner without a $1,500 surfboard whose color matches your car’s paint job, right? The company ordered up 200 from an outfit in San Clemente, California. They sold out almost instantly. Now they’re being sold on eBay at upward of $5,000. “And all this action is before one single board has even been shaped,” says Nilus Mattive of Agora Financial’s Rich Life project — who first alerted us to this insanity. 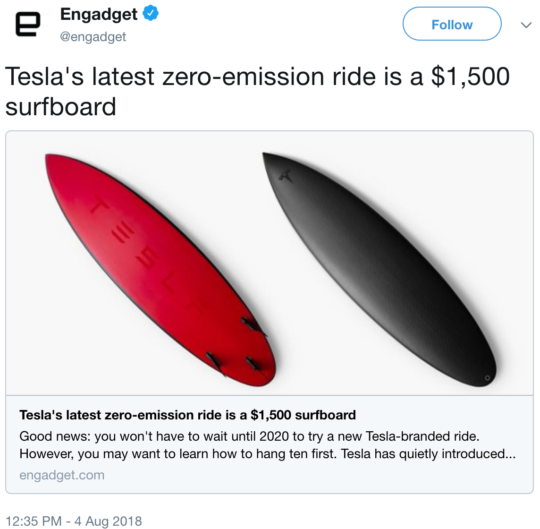 “As a surfer,” he tells us, “I just laugh because the boards are worth $750 without the Tesla logo. “But as an investment analyst, I look at these boards as the symbol of everything I’ve been trying to say about Tesla as a company — it’s total hype being bought by a group of ardent believers rather than logical, long-term business owners. The reader takes issue with our approving citation of Robert Reich discussing the job market on Friday — on the basis, we said, that a stopped clock is right twice a day. “Reich made excellent points,” our reader says, “and it is what I have experienced in the workforce for many years. I have never been in a union, but I see American workers, many with college degrees, unable to find jobs because they hire H-1B visa workers. Unions would not allow jobs to be offshored or workers to be replaced with H-1B visa workers, which is what I have seen for over 20 years. “This wouldn’t have anything to do with the decline of the middle class, would it? Is it always and forever a monetary phenomenon? The 5: Sorry, the decline in union membership and the decline of the middle class is a case of correlation, not causation. Yes, it’s all about monetary debasement and Nixon cutting the dollar’s last remaining tie to gold in 1971. That’s when it all changed, as Agora founder Bill Bonner wrote earlier this year: “Instead of making stuff at home, the U.S. began taking it from abroad and paying for it with its new credit money. “While history is illuminating and may serve to understand how we got to today, it should not be used to make progress impossible, if progress is the common goal,” a reader writes after we reviewed some “ancient history” about the United States and Iran in recent days. “The money was frozen in 1979 for good reason, and giving it back was a big concession and mistake at the time as it simply flowed to support terror activity around the world (not just Syria and Yemen). “You seem to want to defend all their actions as revenge for our past mistakes. I believe you forget that a great deal of the Iranian population is friendly toward America and not their mullahs. Progress with Iran, from where we sit, would look like what the president is doing with North Korea. (Assuming he doesn’t let his minions screw it up.) Really, Trump has the political capital to pull off a Nixon-in-China moment. Also, we’re not “defending” anyone by invoking the 1953 coup or anything else. It’s just context. And yes, for the most part, Iranian people are kindly disposed to the United States even if they’re not as enthusiastic about Washington, D.C. That’s in large part because young Iranians still come to study in the United States, and then they go home and tell their compatriots about what great people we are — once you get outside the Beltway. We need more of that, not less. His point — unless you’re prepared to answer those questions in the affirmative, you’re better off thinking about the real problems Americans face, and who’s responsible for them. P.S. Back to the midterm elections: There’s a chance they could cast a pall over the next earnings season starting in mid-October. So it’s not just people like our own Mike Burnick concerned about the midterms. Still, Mike has perfected a retirement strategy that can help you take the worry out of day-to-day market movements. Indeed, following the strategy could leave you set for life. But for best results, you’ll want to act no later than tomorrow — as Mike explains when you follow this link.